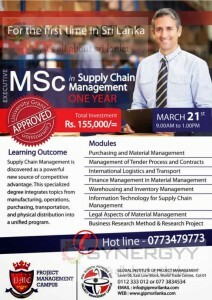 Global Institute of Project Management invited applications for the Executive MSc in Supply Chain Management Degree Programme. Supply Chain Management is discovered as a powerful new source of competitive advantage. This specialized degree integrates topics from manufacturing, operations, purchasing, transportation, and physical distribution into a unified program.